What a feast! We were dazzled and delighted by an amazing Synergy programme bringing us back to the roots of the United Emirates up to its splendid present. At our Synergy 2017 we took “The Big Jump” into ENJO’s successful future together with 100 fantastic ENJOpreneurs. The Synergy in Abu Dhabi took off with a private welcome reception at our five star Synergy hotel, the Fairmont Bab al Bahr, right at the Beach decorated with palm trees, waterparks and a brilliant view on the majestic Sheik Zayed Grand Mosque. In the evening our participants were welcomed to our Global Glamour Party, celebrating a blend of taste and impressions of the modern Middle East and the world. Cleopatra with her snake, Mozart and the Geishas were all there to initiate our Big Jump Synergy together with us. The next morning it was time to explore Abu Dhabi. We visited the Grand Mosque and a museum showing us the impressing history of the United Emirates. A further highlight of our city tour was a picture stop at the Emirates Palace. The sun terrace of the Restaurant Asia de Cuba was the perfect venue for our delicious lunch. In the evening it was time to take the Big Jump with a unique team activity event down at the beach – from man-sized table football over volleyball on a trampoline up to basketball on a bungee line our teams fought to the limit. Congratulation to our winning teams! The next morning was a further gem of our Synergy in Abu Dhabi – our seminar day. Miriam Frier from the UK team, Leah Howells from Australia and Monika Hörschläger from Austria West shared their thoughts and experiences on recruiting with us – thanks once more for your caring and honest words. Then we celebrated our Top 66 Award winners. Fiona Edwards from Australia, you are amazing! Then it was time for the moment we all have been waiting for – the seminar of Johannes Engl. In his speech, Johannes talked about shifting expectations and thinking out of the box. In the end he surprised us with an unique competition – we keep our fingers crossed for you and hope to see you soon in Austria! In the afternoon we were invited to a further unique experience – a trip to the desert. 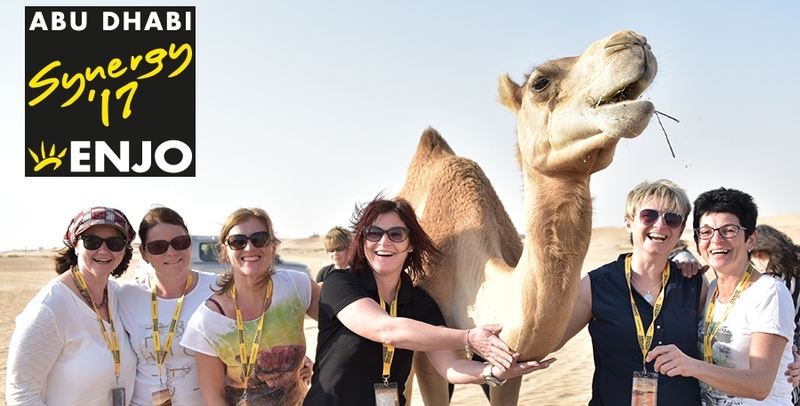 The visitation of a camel farm, a breath-taking dune bashing ride, Arabian music & entertainment like a falcon show, quad driving, tea ceremony and henna painting were on our list, as well as a champagne sunset stop and a barbecue dinner in the desert with bally dancers and a fire show. Thank you so much for sharing these memorable moments together with us! Social ENJO – vill du få de senaste nyheterna om oss och våra produkter? Följ oss!